Кочевник интересен сюжетом и подходом через него к организации механики игры. А неожиданностью берет Живые и мертвые, очень оригинально. В случае выбора реализации, я был бы за первый вариант, но вообще все они очень сильные. The modification includes the entire 12 old little German and Polish mods, and also characters from two Russian mods. All mods are combined the overall storyline. Platform: "Gothic 2: Night of the Raven"
A small start location, a narrow mountain valley with coniferous forest, valley and tavern. The hero - Leroy from the mod "In search of treasures". Two of his companions - from the same place. On the starting location is always night, rain and snow. Sunrise just before the end, when will be played all included mods. (from mod "The people of Minental"). The names of some characters learn in communication with them, then they appear over their heads. And at first, all characters are identified by own occupation. Guests eat, drink, play and communicate. Get acquainted with everyone in the tavern, characters in anticipation of rainy night tell own stories. After the beginning of the loaded of the one from included in this mod the small modification and starts playing from the character-narrator. All inclusive mods is divided into 3 stages: 5,4 and 3 mod. The story of the next stage become available only after played of the mod of the previous stage. When all stories are finished, the rain ends and begins sunrise. Leroy with friends can continue the journey. He says goodbye with the owner of the tavern and with other new friends and goes on a journey. In the beginning of each new story is replaced by Leroy on the main character of the included mod (most often this narrator of the story, but not always - novice Feophill tells stories about other people or beings). Technically replacing the protagonist was already realized in mod "In search of treasures". Leveling in the game for Leroy in mod no this is only in embedded mods. But results are reset when returning to the start location and Leroy's body. For killing any monsters in the starting location is receive 0 experience points, they don't have trophies. Items that can pick up and put in inventory, no. (except fallen from the hands of weapons beaten characters, but them will need return). NPS can beat receive 0 experience, but cannot be kill. After there as NPS will up, followed by a dialogue in which Protagonist returns the character's weapons. 1. 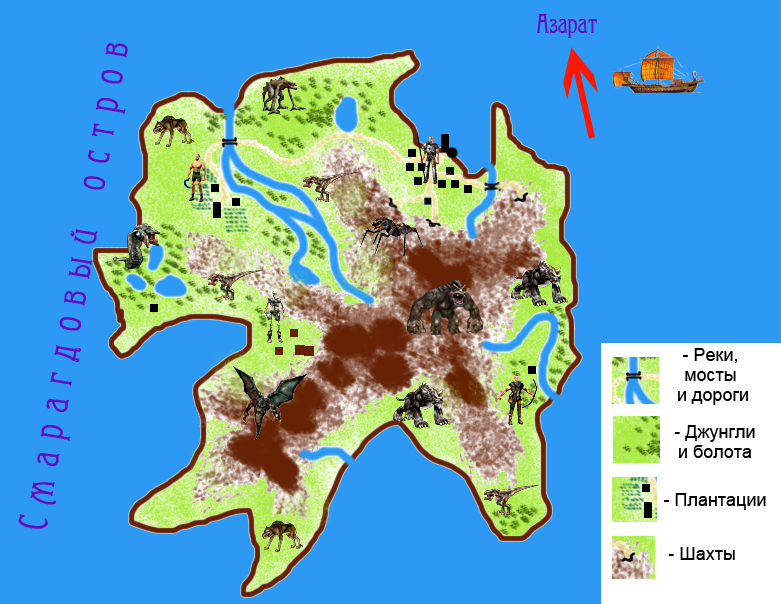 The mod characters "In search of treasures" as the Protagonist and mod "The people of Minental" as the narrators chosen because they very detailed characters and have bright individuality. 2. One of the main problems in the realize of mod is the consent of the foreign authors of the mods (language barrier and difficulties in establishing contacts). The consent of the Russian authors of the mods to include their characters in other project is received. Last edited by Wilde; 10.11.2014 at 13:15. Действие данного мода происходит после событий Arcania Gothic 4. Среди золота и драгоценностей взятых с Чертог Ирдората, пираты находят черный камень. Генри, пират который взял камень в свои руки стал одержимым, он поднял мятеж и приказал изменить курс. Бойня на Эсмеральде, обернулась крушением на темном острове, рыбаки называют этот остров - остров Тумана, по поверьям там когда то проходили темные ритуалы. Тем временем, король со своей армией вернулся в Венгард, но по пути они нашли в открытом море пирата. Этот пират когда то угнал Эсмеральду, оставив Робара 3 и его друзей на континенте. В первой главе пастырь Фешира после войны вступил в ряды королевской армии, узнает от Снафа что пират которого они нашли в море это Грег, капитан пиратов в Яркендаре. Расспросив Грега о произошедшем, ГГ решает попасть на тот остров, но никто из рыбаков не желают туда плыть. На помощь приходит Торлоф, который оставил службу несколько лет назад, и теперь просиживает все время в таверне. ГГ достает Торлофу снаряжение и корабль. Выполняя при этом значительное количество квестов. После они отправляется в путь. Во второй главе ГГ прибывает на остров, где он исследует Эсмеральду, на борту он находит известный меч Коготь Белиара. Но на выходе его атакует маг и забирает меч. ГГ решает разузнать все о происходящем на острове, он начинает исследовать остров. ГГ становиться участником бойни между пиратами и орками. Скип глава пиратского лагеря рассказывает всю ситуацию происходящую на острове. В третьей главе, ГГ возвращается в Венгард чтобы рассказать о случившимся на острове. По поручению короля ГГ возвращается на остров, где входит в недра храма Белиара чтобы остановить призыв зла. В моде присутствуют старые друзья Робара 3: Диего, Горн, Мильтен, Лестер, Торлоф, Ларес, Ангар, Робар 3, Снаф, Ксардас. Венгард, во время суеты в городе, король приказал закрыть ворота ведущие в город. Здесь есть таверна, небольшой рынок, кузница, казармы, главный замок короля, храм, лаборатория, гавань. Также здесь есть несколько побочных квестов. Остров туманов, здесь будет происходить основные действия мода. Здесь можно найти небольшой лагерь пиратов, место крушения Эсмеральды, старые развалины, пещеры, запечатанный проход. Есть несколько побочных квестов, в том числе от Лареса старого друга Робара 3. Храм Белиара, храм находится в глубине острова за запечатанным проходом, станет доступным только в последней главе. Наполнен различными монстрами. Заключающим этапом всего мода является убить темного мага, предотвратив призыв Белиара. В конце мода появляется Ксардас. который рассказывает что черный камень позволяет открыть ворота в темный мир, дабы предотвратить дальнейшие вызовы тьмы, Ксардас уничтожает камень и закрывает ворота навсегда. После этих событий остров Тумана становится частью королевства Миртаны, а ГГ таким образом спас Грега от казни. ГГ может атаковать НПС, забирать инвентарь, по желанию может убить. Главным антагонистом мода является Генри (охранник ворот в Gothic 2 Night of the Raven), также можно встретить в моде всех пиратов из пиратского лагеря Gothic 2 Night of the Raven. В любое время находясь на острове можно вернуться в Венгард. Около 30 видов оружия ближнего и около 15 видов оружия дальнего боя. Руны и свитки также будут присутствовать в моде. В чем я вижу непременное использование articy:draft, в том что это лучший инструмент для детальной проработке действий и истории мода в целом. Виктор, спасибо огромное и за твой концепт и за помощь Дикарю! А ты внес исправления в английскую версию своего концепта? Could use Gothic 2 Night of the Raven but I want to show old characters in modern form on a modern engine. This mod takes place after the events of Arcania Gothic 4. Among the gold and jewels taken from the Hall of Irdorath, the pirates find the black stone. Henry, the pirate who took the stone in his hands became obsessed, he raised a rebellion and ordered a course change. The massacre at Esmeralda turned out to be a wreck on the dark island, the fishermen call this island - the island of Fog, according to legends, there were dark rituals. Meanwhile, the king with his army returned in Vengard, but along the way they found in the open sea pirate. This pirate when stole Esmeralda, leaving Rhobar 3 and his friends on the continent. The mod is divided into 3 chapters. In the first chapter of the shepherd of Feshir after the war he joined the Royal army, learns from Snaf that pirate which they found in the sea this is Greg, the captain of the pirates in Jarkendar. The protagonist ask Greg about what happened, decides to get on the island, but none of the fishermen do not wanted to sail there. Torlof helped the protagonist, which left the service a few years ago, and now sits all the time in the tavern. The protagonist give Torlof equipments and ship. Performing a large number of quests. After there they went on a journey. In the second chapter the protagonist arrives on the island, where he explores Esmeralda aboard he finds a famous sword Claw of Beliar. But the mage attacks him and grabs the sword. The protagonist decides to find out all about what is happening on the island, he begins to explore the island. 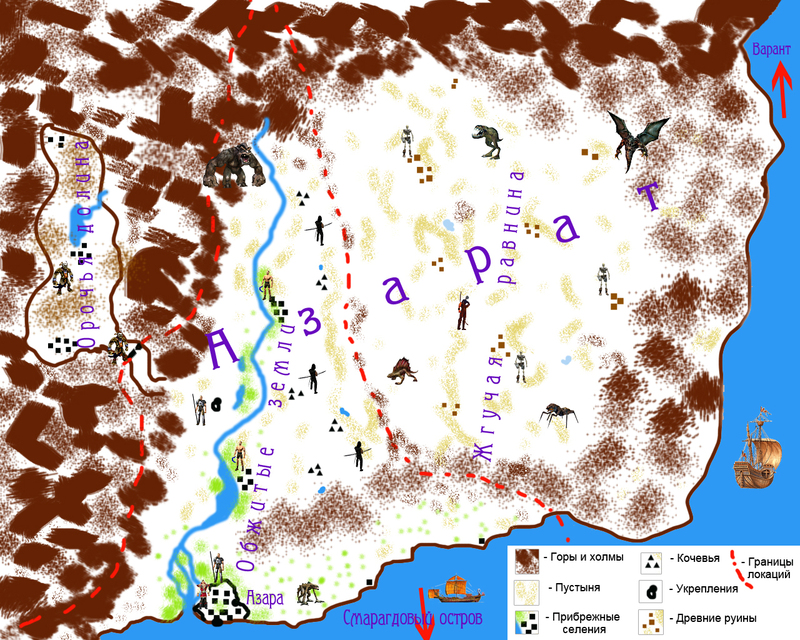 The protagonist become a party to the massacre between the pirates and orcs. Skip the head of the pirate camp tells the whole situation of what is happening on the island. In the mod there are old friends of Rhobar 3: Diego, Gorn, Milten, Lester, Torlof, Lares, Angar, Rhobar 3, Snaf, Xardas. Vengard, during the hustle and bustle in the city, the king has ordered to close the gate leading into the city. There is a tavern, a small market, forge, barracks, the main castle of the king, the temple, laboratory, harbour. Also, there are several side quests. Island of fog, here will be the basic steps mod. Here you can find a small camp of pirates, the wreck of Esmeralda, old ruins, caves, sealed passage. There are a few side quests, including the Lares old friend of Rhobar 3. The temple of Beliar, the temple is in the depth of the island over the sealed passage are becomes available only in the last chapter. Filled with a variety of monsters. Concluding stage of the mod is to kill the dark mage, preventing the recruitment of Beliar. At the end of the mod appears Xardas. who says that black stone allows you to open the gates of dark world, in order to prevent further calls to the darkness, Xardas destroys the stone and close the gate forever. After these events, island of Fog becomes part of the Kingdom of Myrtana and the protagonist thus saved Greg from penalty. The protagonist can attack NPCs, pick up equipment, can kill them. The main antagonist in the mod this is Henry (guard gate in Gothic 2 Night of the Raven), also in the mod can be found all pirates from the pirate camp Gothic 2 Night of the Raven. At any time while on the island you can return to Vengard. About 30 types melee weapons and about 15 types ranged weapons. Runes and scrolls will also be in the mod. What I see is the indispensable use articy:draft, in that it is the best tool for the detailed descriptions of the actions and history of the mod in general. Guarantee the creation of this mod I think 80%. Last edited by Victor26; 11.11.2014 at 07:13. Дикарь, насколько я понял, в "Кочевнике" ты в каждом варианте прохождения отсекаешь две трети контента в основном квесте при выборе определенной жены = образа жизни героя в дальнейшем. Не слишком ли это расточительно? Возможно имеет смысл дать герою выполнять основной квест и в других локациях, но с учетом его навыков и в рамках его уникальной сюжетной линии? Концепция "Живых и Метртвых мне очень нравится (особенно возможность опционально дать дуба и продолжить движение по истории в таком виде). Для игры в стиле фентези я бы взял ее сразу в оборот - такой нетипичный фентезийный детектив. Я советую заранее продумать стилистику города и некоторые его особенности и очень кратко обрисовать в концепте. Попытаться пусть фантастическим, но логичным способом обосновать нынешнее положение дел в городе. Весьма атмосферно выглядел бы город замкнутый, изолированный от внешнего мира, как например в Arx Fatalis. По какой причине? Тотальная эпидемия "воскрешения" и бешенства нежити, которая может сохранять разум только внутри городских стен (по некой таинственной причине, котрую можно развивать дальше). Есть районы. где эти защитные чары слабеют и "мертвые" нападают на всех подряд и так далее... магические взрывы за пределами городских стен и т.д. Все это хорошо повлияет на атмосферу и восприятие местных обычаев. Убийства добропорядочной нежити и вообще смена существующего порядка может быть признаком недоброго влияния извне. "малочисленная секта, считающая существующее положение вещей противоестественным." - слабый образ антагониста. Тут важно ПОЧЕМУ они так думают, откуда они взялись, почему их не устраивает такой порядок, если все живут относительно мирно? Кто подталкивает их к этому решению и зачем. Вообще, здесь нужно еще подумать над основным конфликтом. Ну это так, мои измышления. Достаточно, наверное одним предложением подчеркнуть эти мотивы. LEDsky, да это расточительно. Но зато реиграбельность уникальная, какой ни в одном моде для "Готики" (и, наверное, не только для неё) никогда не было. К тому же, как показывает практика, основная затыка при разработке модов для "Готики" заключается не в создании локаций, а именно на стадии написания и скриптования сюжета. Причём чаще именно написания. В этой фазе загнулось множество проектов (взять хотя бы "Хорану", "Кадуон", "Исход", не продвинувшиеся дальше прологов), для которых уже имелись готовые или почти готовые локации, весьма обширные и проработанные. А насчёт "Живых и мёртвых" ты совершенно прав, там ещё много чего продумывать надо. По сути, это первые наброски по мотивам идеи, внезапно возникшей в ходе форумного обсуждения. Last edited by Wilde; 08.12.2014 at 08:48. Ждем детальку, чтобы восстановить комп. Пишу с ноута моего мужа. Мой скайп потерян, вернее остался на моем компе, поскольку вырубить скайп мужа не могу, у него слишком много дел через него решается. К сожалению, пока не могу лично пообщаться с Каем. Надеюсь, что это произойдет в ближайшее время. В любом случае, все работы передала с пояснениями на суд нашего жюри. Разумеется, сама проголосовала за наших!